Why it matters: Leaked renders of the Google Pixel Slate tablet show stereo speakers, a USB-C port, no headphone jack and a blue detachable keyboard. They also suggest it will be coming with a Pixel pen in a new blue color and possible cellular connectivity. Leaks from Google’s October 9th event are common as dirt. At this rate, Google might as well just cancel the event seeing as we know everything. Since before the Pixel Slate name was even leaked, we knew the device (codenamed Nocturne) would have a 3000 x 2000 screen, up to 16GB of RAM, and come packing an Intel i7 processor and support for NVMe storage. Through four entries onto Geekbench 4, it was discovered that the i7 was the i7-8500Y with 2 cores, a base clock of 1.5Ghz and boost of 4.2Ghz, a 4MB cache and a 7W TDP. While the i7-8500Y only launched this quarter, it’s already known that the chip is not as powerful as one might expect – only achieving roughly 8050 points in Geekbench multicore and 3750 in the single core benchmark. That’s roughly on par with the cheaper Microsoft Surface 5 results, but it’s 15% worse than the current iPad Pro, a device the Slate is expected to compete with. A prior leak discovered by 9to5google.com, showing the Pixel Slate connected to the Brydge Wallaby, the first 3rd party keyboard for the device. It’s a tough battle between the three devices as to which has the most features – the Pixel Slate has a fingerprint scanner like the iPad Pro while the Surfaces have facial recognition. The Slate has a slightly higher resolution, but can’t match the 120Hz refresh rate of the iPad Pro. The Slate and Surface Pro are configurable to 16GB of RAM, but the iPad Pro caps out at 4GB. And of course, only the Surface and Slate's keyboards have trackpads. 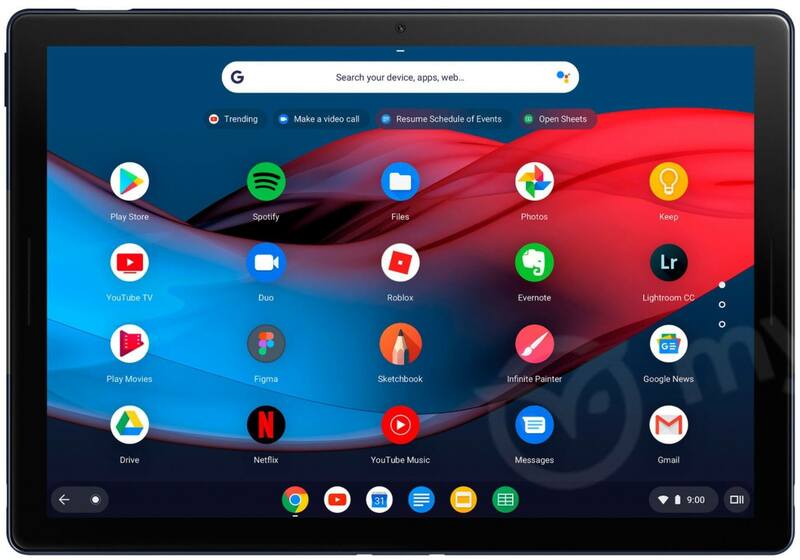 Your preference might also be based on the operating system, seeing as the Pixel Slate is running ChromeOS, something pretty new to the tablet scene. Fortunately, it’s expected to support Android apps, and possibly other Linux apps. The one thing we don’t know about the Pixel Slate is pricing, so unless there are even more leaks (entirely possible at this rate), it seems we will be waiting for something on October 9th. The dark lines on either side of the back of these Pixel Slate renders, obtained by mysmartprice.com, are very similar to the cellular antenna lines found on other devices.